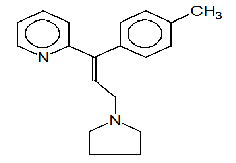 Triprolidine (Actidil) is an anhistamine molecule having chemical name: Trans-1-(4-methylphenyl)-1-(2-pyridyl)-3-pyrrolidino prop-1-ene. It is used in making a popular Actifed drug. VMSRF has now developed a patent non-infringing process which is very cost effective and ready for commercialization. The best advantage of our process is elimination of the usage of hazardous butyl lithium which is hitherto used to make this drug. Its chemical name is Trans-1-(4-methylphenyl)-1-(2-pyridyl)-3-pyrrolidino prop-1-ene. c)Can be easily scaled up and ready for commercialization.